Jonah is not a typical hero, he is an anti-hero. The Call occurs safely on dry land. Jonah refuses and his doubt takes him on a ship beautifully symbolising debate. A ship is an in-between space neither safely on dry land nor completely immersed in water. 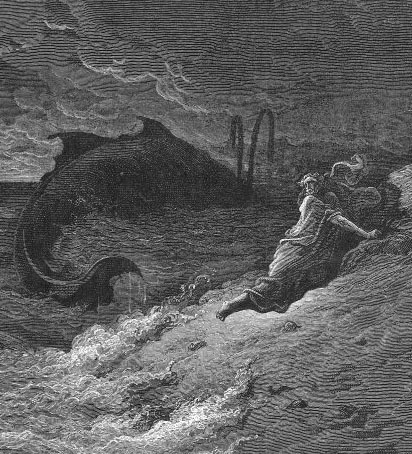 Jonah is plunged into the sea, completely immersed and engulfed. His journey is short but dramatic. The ultimate in-between space is the belly of the big fish. He is neither dead nor alive, neither safe nor in danger. Caught in the darkest moment that has the potential for the most enlightenment – caught between the Ordeal and the Reward. Back on dry land Jonah returns to his calling and completes his mission. Two of the stages of story represent in-between worlds. Like dusk and dawn these stages are full of duality and contrast. They are marked by confusion, emotion, fear and ultimately resolve. I call them the “twilight zones”. A twilight zone is a crucial stage for transformation and often is neglected or fumbled because of its complex and paradoxical nature. It is in handling these stages with care and confidence that will make your story successful and stand the test of time. In our story class we played with just the first of the two twilight zones: on the ship before the crew drew straws. This, we decided was Jonah’s most fearful moment. We used a version of the structure sometimes called ‘cop in the head’ to identify the different voices in Jonah’s head at this moment. I invited one person to take a position that shows how Jonah is feeling. Then I invited the rest of the class to take the places of different voices that may be plaguing him. We repeated the exercise twice and what I loved most is the two different Jonah’s we looked at. The first was stressed out sitting in a heap swearing with voices like: ‘it’s your fault’, ‘you did it again’ and ‘at least you tried’ in his head. The first Jonah neutralised the voices mainly by accepting his fate and getting ready to be launched into the water. The second Jonah decided to take matters in his own hands. He did not wait for the crew and jumped in before they even got to him. Very good example of how different people resolve their twilight zones: some are reactive and some pro-active. It was great fun to play with both and we all learned something about ourselves. Jonah turns out not to be a classical hero riding into the sunset with his pockets full of dollars and his arms full of damsel. After Jonah’s triumph, we do not find him in a state of exuberant joy. Instead Jonah is an anti hero. He sits complaining to god, angry that god did not destroy Nineveh for their evil. It seems that the real reason for Jonah’s initial refusal of the call of God was precisely his fear that God would not punish Nineveh like they deserved but have mercy on them. His fish experience was therefore not lasting and he is at the start of a whole new journey. Still the elixir of the story carries beyond Jonah and Nineveh to all who is struck by the love of God for all people. This love is the elixir for the complaining prophet who does not really transform, for wicked sinners like the people of Nineveh and for “also much live stock” (Jon 4:11)…. For those of you who are not yet part of this class and want to be, you can still join our story class next week, but you will have to commit for 6 weeks at a price of R600. We play at 6 Neetling Street Stellenbosch. Subscribe to our Useletter and get info on the next course in your area. Alternatively, keep watching this blog. Next PostNext Story class 1.3 – Whose story are we working with, mine or the character’s?